It's the month of December! How was your day so far? I'm flying to Surabaya tonight and will be back on Monday. Meanwhile, I wish you a wonderful weekend and the start of the last month of 2011. Anyway, YSL Resort describes well my mood today. Gorgeous red dress above, and here are the colorful mix of shoes. A lot of us, psst.. I'm referring to fellow shoe craze here, have been familiar with the different kinds of YSL signature heels, name it the Tributes, Tribtoos and Palais. For Resort 2012, Pilati came up with amazing fresh looks of them. I love the Tribtoo with the black patent toe cap. They're so perfect! And here are the jelly textured platforms, what do you girls think? They look comfortable, but personally I found a lot of jelly shoes very heavy, especially Mellissa. I need to know whether anyone has tried them on, and how they fit in person. Still, the remaining question here is 'Would you wear plastic shoes'? They're available for pre-order at Saks here. Coral Tribute sandals never fail. Should I get them? 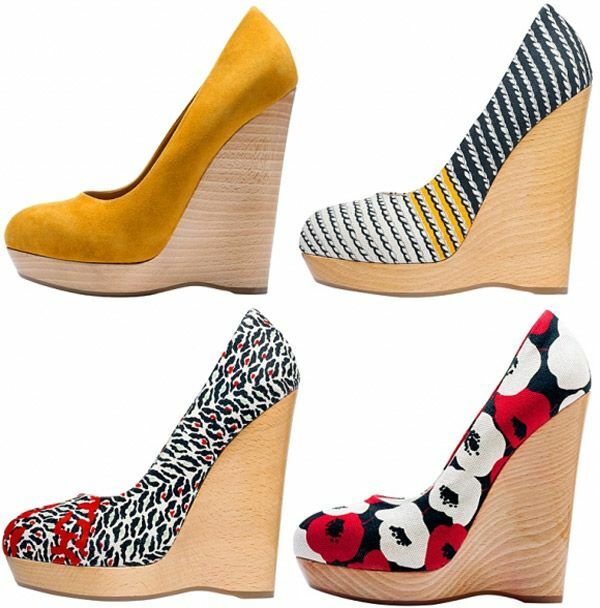 And finally, these are probably the prettiest floral canvas wedge platforms I've ever seen. This is beautiful, all women are very lucky with this shoes. wow these shoes look sooo amazing!! above all the wedges. so gonna buy that red suede tribtoos! but my first pririty is still the dolly. *priority. i have an OCD. I LOOOOVE the ones the model is wearing in picture 1! It's a beautiful dress, I agree! In cold winter, most people are considered warm, and easy action. Ugg sequinvery famous professional keep warming around the world. In cold winter, most people are considered warm, and easy action. sparkle uggsvery famous professional keep warming around the world. I like this article, cheap ugg sparkle boots give us a better life. The womens sparkly ugg boots is a stylish and glittery take on one of our most famous boots.